Blackboard basically is an online system and tool that is used for most online classes to interact with the students likewise in a typical class learning system. This course is specifically designed for teachers as well as scholars and intellectuals from social and business arena. Holder of blackboard certification will be able to cater the need of modern pedagogical techniques and enabled them to successfully use the technological tools in the field of education and research. In the era of information and communication technology, blackboard teaching certification is exactly what is required now and in upcoming period. Experts define online blackboard teaching is an emerging and essential tool in the education field. As online education system grows, demand for holder of blackboard teaching certification also grows. This online certification will equip you to efficiently manage the course material, presentations, assignments, discussions with students and delivery of knowledge in an online environment. All learning can take place whether in a group or one-to-one communication between teacher and pupils. This will also provide a different environment to enrolled students in a particular course by learning changing skills of online environment in order to get instant response from expert teacher beyond the concept of time and boundaries of geographical locations which is almost vanished in modern and online education system. Being a professor, researcher or prospective teacher, if you are planning to enhance your pedagogical and teaching techniques then blackboard certification is the right choice for you. By getting blackboard teaching certification, you will become an effective teacher who wishes to enhance their skills and effectively deliver their knowledge in an online environment. The blackboard teaching certification program from Brainmeasures is a unique certification in terms of contents, design and delivery of knowledge which will allow you to become proficient with changing needs of education sector. This online certification will provide you a competitive edge in both conventional and online education system in terms of designing and managing your all course related activities in efficient online and easy to use interface application. Throughout the course, you will learn about different requirements and components of course compilation, designing and managing through blackboard and how to keep them engaged the enrolled students effectively in an online system. Apart from the course mechanics, a blackboard exam is also covered in the program in order to assess your learning’s and skills as well as hone your knowledge about the field. After a successful attempt, you will be on right way to get your blackboard teaching skill certificate from Brainmeasures. This will be definitely an added skill to improve your resume and will make it easier to get the job that requires you to teach the students in an online environment through a learning management system. Entitlement of blackboard teaching certification also translates to increase in income and better flow of wealth generation. The average annual salary for those who hold teaching or research positions in an institute, is $50,000 and this amount may vary significantly based on the type of institute, location, popularity of college/university/company, benefits and experience of the teacher/researcher/scholar. 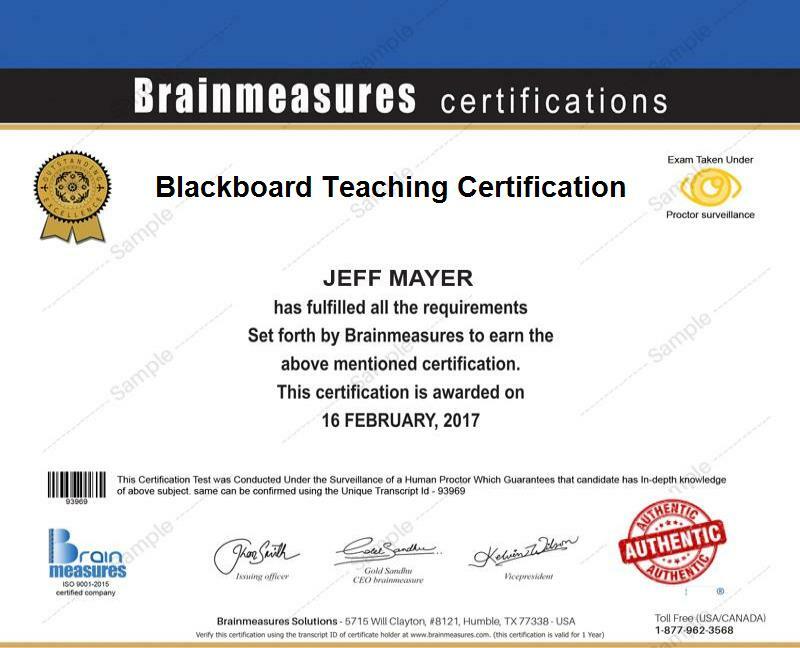 No requirement or qualification is needed to take part in the blackboard teaching certification program offered by Brainmeasures. However, it is safe to assume that the entire program is primarily directed towards individuals who wish to become more familiar about the teaching and modern pedagogical techniques. The course is ideal for aspiring teachers, researcher, scholars and prospective teachers who aim to start teaching or already engaged in online education system.